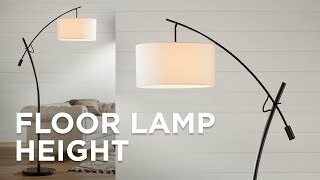 The design of this contemporary floor lamp isn't just simple – it's simply elegant. 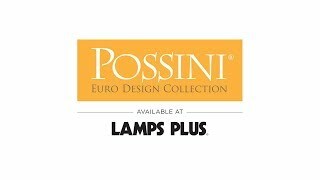 For a clean retro look, try this modern contemporary floor lamp from the Possini Euro Design brand. The slim black body contrasts beautifully with the white drum shade on top, with brushed nickel finish accents adding an attractive gleam. This design rests upon a base made of metal cross rods for a subtle geometric look. The result is a simple yet striking lamp that illuminates the whole room. 64'' high. Shade is 18" wide x 11" high. Base is 19" wide. Feet measure 1 1/2" high. Weighs 10 lbs. Uses two maximum 100 watt standard base bulbs (not included). Dual on-off pull chains. Modern contemporary floor lamp from Possini Euro Design®. Black and brushed nickel finishes. Metal construction. White linen fabric drum shade. Includes 8-feet of brown cord. is there a matching table lamp? BEST ANSWER: There are no matching table lamps in the collection. 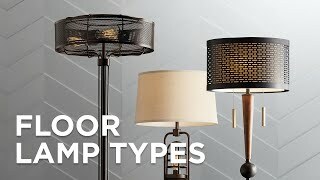 But, we have many other choices to choose from which will compliment this floor lamp and I have added a few below. what is the height on the 4 feet of the base? BEST ANSWER: The height of the base of the lamp is 1 5/8 inches. 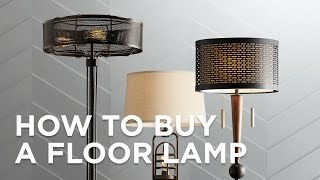 What is the lampshade color? BEST ANSWER: Hi - it's a white shade. Remember that your choice of bulb type could make the shade look a little different when illuminated. Nothing wrong with it, puts out good light with two 60-watt LED bulbs. I like the base as it's more stable than a circular solid. Lamp is almost new, but metal cord just broke off in my hand. Not happy. Hi Peter F., sorry to hear that your lamp has an issue with the pull chain. Our customer service team has reached out to you to confirm your order details and assist so this can be made right. Please direct any questions or concerns to them. Thank you.